I hope you are seriously and prayerfully considering the challenge David Bell gave us two weeks ago to read through the Bible this year. This will be a group project. We will commit together and support each other along the way. 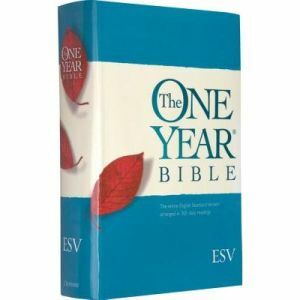 We will be using the ESV One Year Bible which has divided the whole Bible into daily readings. Each day you will read a portion from the Old Testament, the New Testament, the Psalms and Proverbs. It takes about 20 minutes to read the portions for the day. Some people prefer to read half in the morning and half in the evening. Whatever works best for you. Fortunately, this reading plan is the same as the one followed in the Daily Audio Bible which St Andrews is heavily promoting. 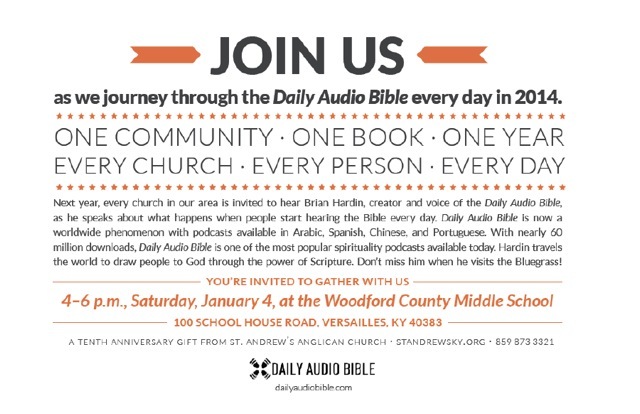 Brian Hardin, the producer of the Daily Audio Bible will in Versailles for a multi-church presentation on Jan 4th. So, whether you listen or read or do some of both begin planning on making 2014 the year you read through the whole Bible. Don’t be surprised if the Lord meets you in unexpected and life-transforming ways. How wonderful that we can lay this most important foundation stone as St Peter’s Anglican Church moves into its first calendar year as a full, independent parish!